Colorado Springs Professional and affordable hair service with a different approach to Hair extensions with the privacy of one client at a time. Extensions may be used to increase body or add length to hair. Whether you’re in the entertainment industry, a business professional, or a stay at home mom, extensions can give you an entirely new look in one afternoon. Fusion Method (Hot or Cold) is a strand by strand technique, no tracks. I recommend this for thick to medium hair types. You have full range of motion, styling possibilities are endless. Toss it up, blow dry, let it flow or can be pinned up and placed in a high ponytail. Process is done with hot or cold applications. I've been asked does this damage your hair. Well, any technique can damage your hair if not done improperly. As I mentioned above, in my professional opinion this is not recommend for clients with thin, soft, or receding hair. Cold fusion allows a closer application to the scalp. Braidless Sew-in Method is achieved by adding commercial hair (extensions) to a braided foundation. I offer 6 different foundation types, which is determined by the clients natural hair growth pattern and the desired finished style. I do not recommend this technique if you Shampoo your hair more than once a week. I recommend wearing this technique no longer than 10 weeks. Hair is firmly braided without any stress or tension on the natural hairline, hair is then applied by a sewing technique that allows the hair to lay flat and undetectable, hair is cut and artistically styled!! 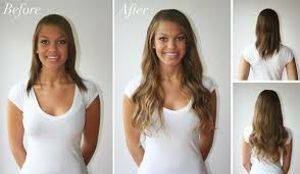 This hair extensions method is the least expensive offered at our salon, application time from start to finish can be 4-5 hours. A benefit of a sew-in is to allow the hair to grow. In order to achieve this, a sew-in should not be worn for more than 10 weeks and results are always best when done by a professional!! A sew-in is an investment. And I recommend quality hair so your investment can last without shedding, matting and tangling. Virgin Indian Hair(can be used for 6 months with proper home maintenance) especially if the length of the finished desired style is longer than 12". Clients can purchase hair in our salon or bring they're own hair to the hair appointment. Seamless Method is a new innovative technique. Hair is already on the attachment, resulting in faster application. Extensions are applied to hair similar to a sandwich technique (above and below) and last 2-3 weeks, tracks/weft are very flat, undetectable, can be used on most hair types, great range of motion, allows hair to be pulled up or back, hair can be reused. This technique is great for adding length to the bang area without bulk. Micro-link Method is a strand by strand adjustable technique. Extensions are applied individually to clients hair. The shells/tubes are very small, very light weight, strong and undetectable. The inside of the tiny tubes are coated with a special silicone compound that protects the hair from compression and related stress. 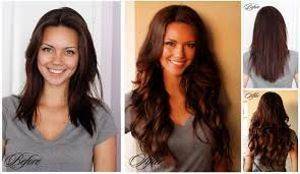 Time it takes can vary depending on texture of your hair 3-5 hours and is highly favorable among many clients. We recommend this on non-relaxed hair. Benefits of this Extension: hair can be reused for 6-9 months, hair extension does not have to be removed to be reattached (like fusion) add highlights without damaging your natural hair, you can blow dry, curl, shampoo as often as you like, pull it back, toss it up, styling is endless. Many things are taken into consideration to determine the price for this service. Hair texture, thick hair requires more strands than thin/soft hair. If you want to just add volume, length or both. Braid-less Sew-In is a technique similar to the traditional sew-in, only without the braid. Yes, without the braid. Hair is left out between tracks similar to bonding method. Recommend for medium to thick hair types and relaxed hair. This technique is not recommended for un-relaxed hair. Very time consuming, depending on hair texture this technique can last up to 2 months with maintenance appointments, can be pulled up or pinned back.